Video coaching is the the most effective way to rapid improvements. Meet Didier PITER and team on the beach for a 2h session followed with video analysis. He will give you all the keys to get to your next level, at the Hossegor Surf Center. – Prepare a video clip with 5 to 10 waves. – Upload clip (on Wetransfer.com, dropbox.com, youtube.com, vimeo.com…) and send link of the clip on PayPal link. 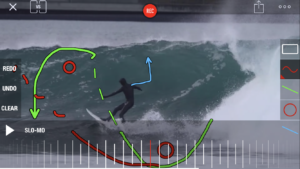 – Didier PITER analyses your video with a top-notch video coaching App, and identifies all the key-points to your progression. – Get the complete video analysis link within 8 days. 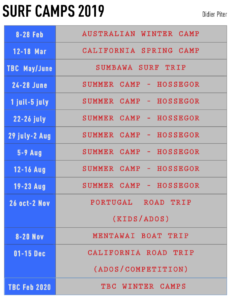 Meet Didier PITER for and intensive surf camp in Hossegor in Summer or warmer surf locations Off-season. Work intensively on adaptation, wave usage, and pure technique. Didier Piter analyses your video and sends you a complete analysis (8 to 15 min length) with goals of progression within 8 days.